His Holiness the Je Khenpo presided over the consecration ceremony of the Tormazhing Pema Yeosel Choeling Lhakhang at Tsakaling in Monggar yesterday. The lhakhang construction began in 2014 and was completed last year. The temple was constructed with funds collected in donations from the people of two chiwogs of Tsakaling. The Lam Neten of Trashigang Rabdey, Karma Rangdroel, who is from Tormazhong coordinated the project. Close to Nu 30 M was spent on the construction. “I coordinated the construction of the lhakhang to purify negative karma and for the well being of the sentient beings,” the Lam Neten said. The local people are looking forward to conducting religious rituals and ceremonies comfortably unlike in the past. “The old temple is small and it was not very convenient to hold religious ceremonies,” Tsakaling Gup Karma Sonam Wangchuk said. 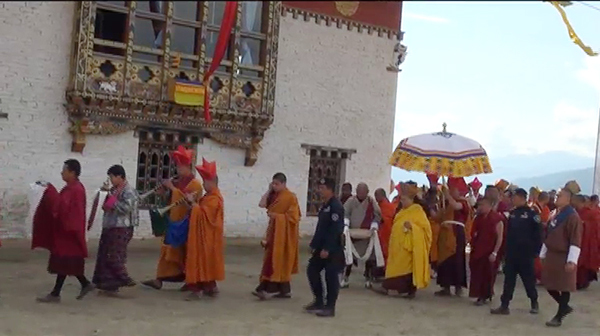 His Holiness has appointed 49-year-old Karma Penjor from Trashigang as the new Lam of Karma Yoesel Choeling Lhakhang. He is currently the Lam of Thrimshing Tsangpo Lhakhang in Trashigang. In the evening, His Holiness administered Kawang to the public gathered for the consecration.